We offer high quality solid dyes, suitable for wax and paraffin bases. Dyes for candles are completely dissolved, there won't be any clots in the candle mass, and staining will be even. In addition, the finished candle keeps the brightness of the color, the surface is not flaked, does not tarnish with time. 1. How to increase the number of shades? The dye is easily crushed into small pieces, which allows you to mix it with other dyes, thus creating a variety of colors and shades. Dosage depends on the fat content, hardness and purity of candle mass. More dye is required for wax candles. To dye the entire base of paraffin weighing 1 lb, only 0.02-0.06 oz of dye is sufficient. For wax weighing the same, you need to add 0.03-0.08 oz. Entire dyeing. The dye is added to the paraffin mixture of the melted base, is mixed thoroughly until full solidification, and then poured into a mold. Partial dyeing. Dipping finished product in the solution is carried out after the complete solidification of the candles. WHAT YOU GET: It is great fun on making your own candles with vibrant and pure color. Total 16 colors dye bag (0.15 oz each color). Total weight is 2.4 ounce. It is an ideal set for newbie or pro. to use. You can mix colors to achieve unique shades. Beautiful 16 Colors Candle Dye are: Royal Blue, Brown, Watermelon Red, Big Red, Yellow, Orange, Transparent White, Violet, Black, Grass Green, Orange Red, Lake Blue, Fluorescence Blue, Fluorescence Green, Peach Red, Dark Purple. SMALL DOSAGE: Only need a little amount 0.02-0.06 oz. of candle dye for 1 lb. of candle mass is necessary for full coloring of the candle mass. It's great value to achieve the outstanding candle product that made by yourself! 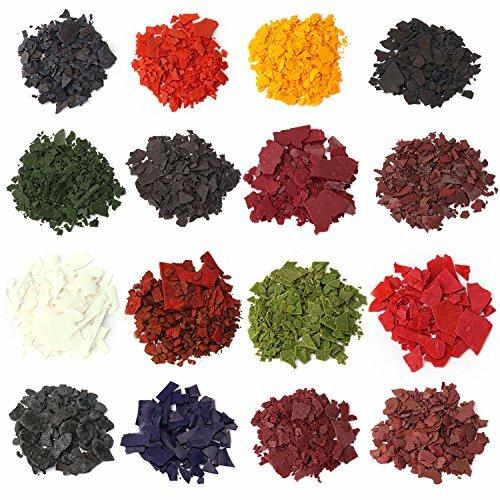 USAGE: This solid dyes chips are suitable for wax and paraffin bases, just after wax or paraffin bases is dissolved, and the temperature reaches 195 - 230 °F, please put the dye chips in it and mix them carefully for a minimum of 2-3 minutes for full coloring. The dye chips are best dissolved at the temperature between 195 - 230 °F. SAFETY: We offer high quality dyes, These dyes are cruelty and vegan free. They are non-toxic, animal friendly, irritant and stain free, gentle and safe to skin. NOTE: The reason why the candle does not dissolve may be is the amount of dye is too much. Mix a proper amount of dye and a little raw wax, heat to 195-230 °F, stir evenly. After it is completely dissolved, mix the remaining wax evenly. View More In Candle Making. If you have any questions about this product by AOND, contact us by completing and submitting the form below. If you are looking for a specif part number, please include it with your message.